Astronauts Stephen Bowen and Alvin Drew have successfully connected a backup power cable to the space station's Tranquility module, the first major objective of today's spacewalk. "And Houston, I am notifying you that the J612 task is complete," spacewalk coordinator Nicole Stott radioed from orbit. "Great job, Nicole," Timothy Kopra replied from mission control. "Good work." Kopra was the Discovery crew's original lead spacewalker, but he was injured in a bicycle accident in Houston in January and was replaced by Bowen. Kopra is in space station mission control to provide advice and assistance as needed. "I'm really looking forward to working with you guys ... and helping out where I can," he radioed earlier. "It's great to hear your voice," Discovery astronaut Michael Barratt said from the station. "It's a big comfort knowing you're down there and watching over us." "Thanks Tim," Bowen called from the space station's Quest airlock. "Hey, good to hear your voice, Steve," Kopra replied. "It should be the other way around, though," Bowen said. "You're a good man for the job." The J612 cable will provide power to Tranquility if the module ever has to be disconnected from the central Unity module to repair or replace a critical heat exchanger. The Discovery astronauts plan to attach a new module to the station Tuesday that will block access to the power line socket. With the cable in place, the new module can be attached and Tranquility will have backup power if it's ever needed. 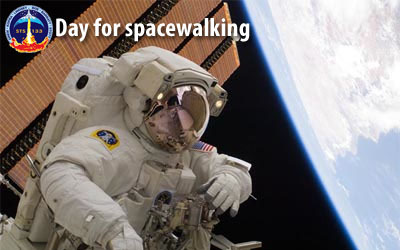 The spacewalkers now are moving on to their second major task, moving an out-of-commission 800-pound ammonia coolant pump from a temporary mounting point where it was left last August after a three-spacewalk repair job to an insulated enclosure on a storage platform. The pump will remain there until it's returned to Earth aboard the shuttle Atlantis this summer. Bowen and Drew, floating in the International Space Station's Quest airlock module, began the spacewalk 32 minutes ahead of schedule when they switched their spacesuits to battery power at 10:46 a.m. EST to officially kick off a planned six-and-a-half-hour spacewalk.